Like many dairy processing facilities, this one uses a DAF to remove protein, fats, oils, grease and suspended solids from the wastewater stream. DAF operations use chemical coagulant and flocculant to increase solid particle size. Micro-bubbles attach to the particles, causing the suspended solids to float to the surface where they are skimmed off. This process clarifies the process water before it is discharged to the city utility. This dairy facility processes 600,000 gallons per day at their on-site wastewater pre-treatment plant (WWTP). 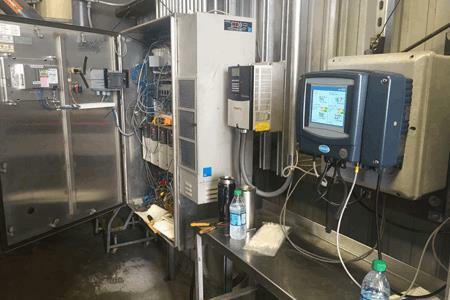 Before installing RTC-ST, the WWTP operator working the overnight shift made manual adjustments—based on visual observations and readings from a Hach Solitax probe—to manage effluent total suspended solids (TSS). One challenge is that the pH levels have to be within their wastewater discharge permit. This presents a challenge because the chemicals that help control TSS also reduce pH levels. Their sewer bill is tied to the flow, BOD and TSS levels of the effluent they discharge, so treating and balancing these parameters more efficiently could have a real impact on the bottom line.